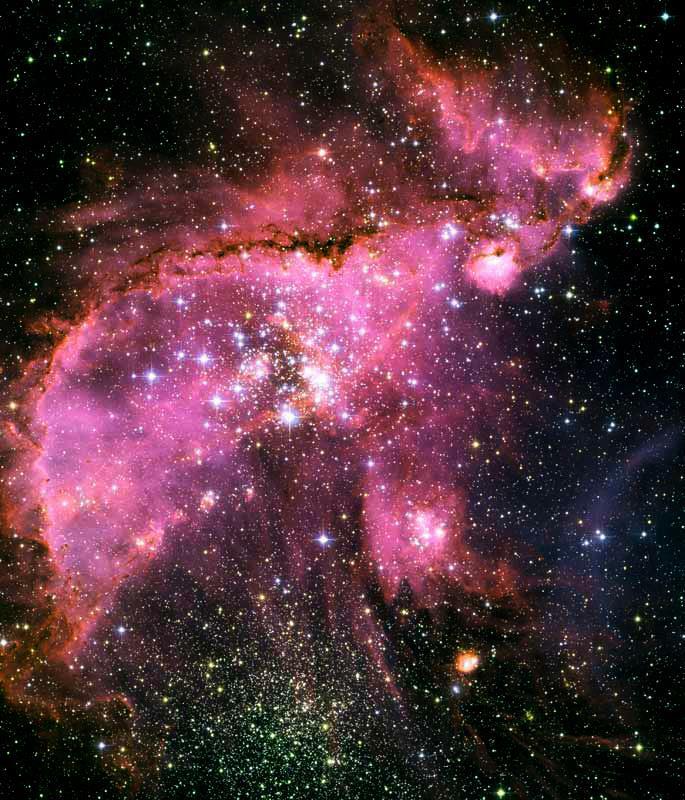 In this Hubble taken image, one can see the utter beauty of the Small Magellanic Cloud (SMC), which is one of the satellite galaxies belonging to the Milky Way. At the very center of this image, about 210,000 light-years from Earth, lies NGC 346, an active star-forming region where a cluster of stars reside. Since most of the stars have progressed beyond the first phase of stellar evolution, we can peer into the heart of these stellar nurseries, through the windows that were forged by the energetic outflow of ultraviolet radiation. Said radiation slowly eats away at the large chunks of obscuring dust, allowing the light from within to shine. The wispy filaments seen in here also mark the path each stellar outflow took after blowing away from a star. Overall, they create the ragged arch formation, which ultimately gives the region a defined edge. See a larger image here.